Let's conclude this month of Nintendo 3DS coverage and reviews with an indie eShop game that released in the fall of last year, Whoa Dave! It's made by the same team that created the Bit.Trip Runner games, so it should be of similar quality, right? Is it safe to assume that? Let's find out with my review. A game packed with more "whoa" than a younger Joey Lawrence. Whoa Dave! 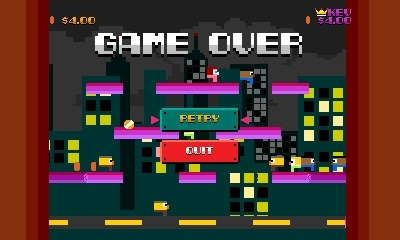 nails the old school and arcade aesthetic right with bright and simple retro graphics. However, it doesn't just look the part of an old school arcade game, it plays the part as well, even down to simple pick-up-and-play action. Without knowing anything about Whoa Dave going in, I quickly understood what I needed to do soon after I started a gameplay session. An amazing feat all to its lonesome, but it also shows how simple to grasp the gameplay of Whoa Dave! really is. The game has you choosing from one of two modes, Deluxe or Classic. Both offer the same gameplay style with Deluxe granting you access to more characters to choose from. Each contain a different leaderboard (which is unfortunately local only) to try to get the best scores on. I get the feeling we're going to be seeing plenty of coins very soon. Whoa Dave! 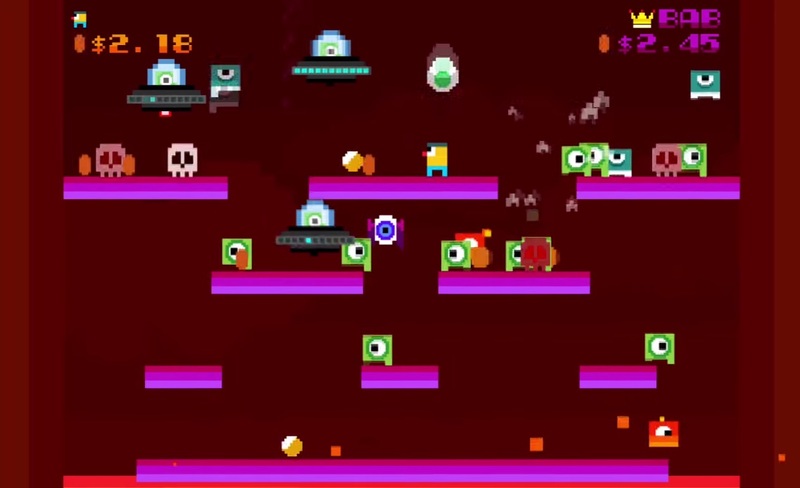 tasks you with running left and right, and jumping on platforms, grabbing eggs that will eventually crack open and reveal an enemy if enough time is allotted and exploding skulls which wipe out enemies and eggs alike. Every destroyed egg or defeated enemy drops a coin. The goal of Whoa Dave is to nab as many coins as possible in a gameplay session before all of your lives run out. To help out are occasional Whoa Blocks (a la Super Mario Bros. 2's POW Blocks), which serve the purpose of obliterating every enemy on the screen if thrown onto solid ground. Every enemy leaves a coin, so it becomes mondo richness time. 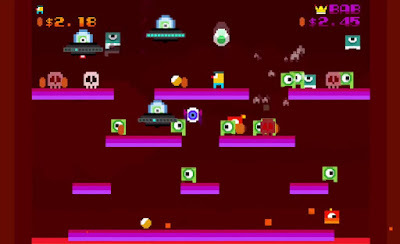 As your coin total grows in a gameplay session, the difficulty steadily ramps up, introducing flying eyeball enemies and UFOs which can destroy platforms. More enemy eggs and less exploding skulls begin spawning. 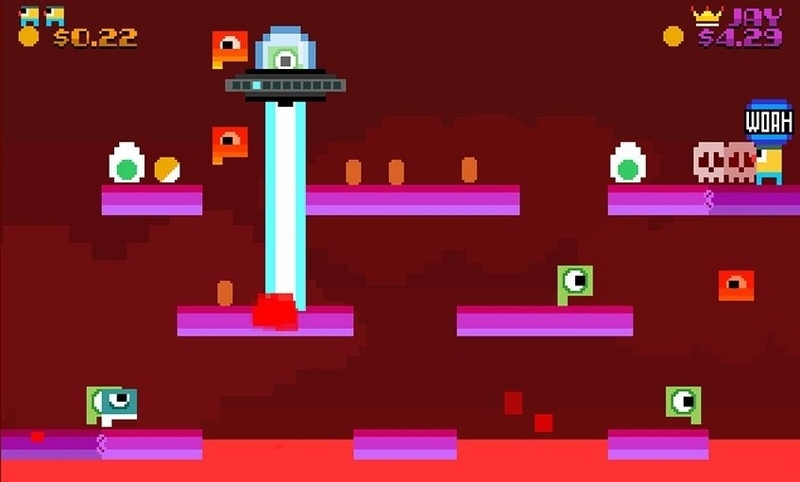 Additionally, the bottom floor will slowly catch fire, turning the once safe floor into a pool of lava, making enemies that fall into it catch fire and race across the gameplay area. It can become quite challenging for a different reason, though. Many times eggs and other throw-able objects appear directly next to one another, and it can be rather arduous to pick up the object you want. This can make you lose lives in some very cheap and frustrating ways. There are three different level choices to select from at the beginning of a gameplay session. My favorite has portals on either side of the top platforms, where throwing an object through one makes it appear from the other. It makes for some zany action. In addition to playing for high coin totals on the leaderboards (again, local only, sadly), there are several achievements to try to complete, such as reaching specific point totals, defeating a certain enemy a certain way, and so forth. 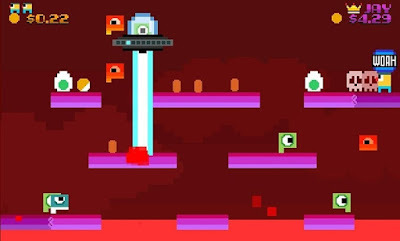 If you're not a fan of arcade-styled games where it's not so much about making progress to unlock content or further the gameplay experience and more about setting high scores, you won't find Whoa Dave! as an arcade offering any different from older efforts in the genre. For everyone else, Whoa Dave! gives plenty of arcade awesomeness with few drawbacks (e.g. no online leaderboards and some annoying moments where the action gets a bit too crazy to follow).